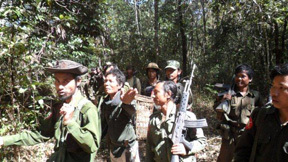 A report by the humanitarian group Free Burma Rangers (FBR) has accused the Burma Army of human rights abuses and armed mobilization in Karen State despite Burma’s Government holding ceasefire negotiations with Karen leaders two weeks ago. In Karen State no ceasefire agreement has yet been signed, but both the Karen National Union and the Government of Burma have ordered their troops not to shoot at each other. In spite of the ‘no-shoot orders’ the FBR report has catalogued ongoing incidents, including shootings and the use of forced labour of villagers. According to the FBR report the troops responsible were identified as soldiers of the Southern Command, from Battalion 60 and Battalion 351. “Burma Army troops fired mortars and fired machine guns into IDP and village areas near Ler Doh in Kyauk Kyi Township in Nyaunglebin District, Western Karen State… the villagers ran and no one was hurt”. Free Burma Rangers are a humanitarian organisation that work deep inside Burma documenting human rights abuses and deliver emergency aid to displaced people. Between the 16th and the 23rd of January, the Burma Army mobilized forces, sending them into South Karen State: “SPDC Infantry Battalion 61 and 62, Light Infantry Battalions 591 and 343, advanced and secured the road in the Anankwin and Thaphuzaya areas. They resupplied. When they arrived at Anankwin village, they told villagers to make baskets for their loads. Four baskets from Htee Kler Ni, ten from Htee LerHsaw, tenfrom Lu Shah and ten from Mae Klu villages, Win Ye Township, Dooplaya District.”. The FBR report documented that isolated fighting between the Karen National Liberation Army and the Burma Army – on the 22nd of January “KNLA and Burma Army forces fought between Lay Day Burma Army Camp and Play Hsa Lo camp” leading to the death of one Burma Soldier, with no casualties on the KNLA side.